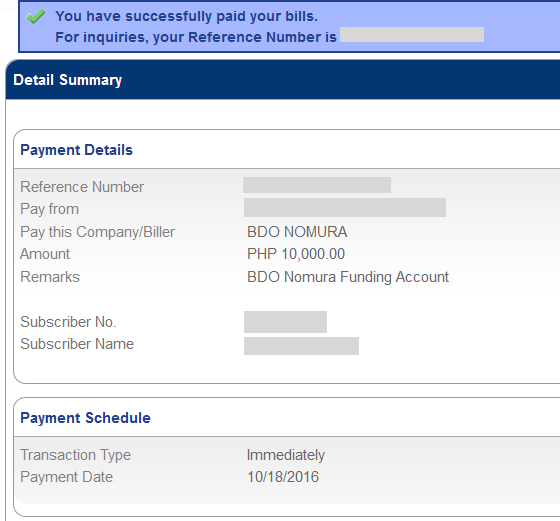 Here’s how to fund BDO Nomura account online and offline. I will show you the step by step procedures on how to do it online and offline since many folks here are asking about the guide to fund BDO Nomura. You can do this through over-the-counter, online banking, BDO mobile app (mobile banking, and using ATM). It is recommended to fund your account on or before 10 p.m. to be included for the next trading day’s buying power. Last time I checked, BDO didn’t charge a fee in funding my account. I already saw the money credited to my trading cash balance the next day. Select the account you wish to use in funding your BDO Nomura account. Select BDO Nomura. If you did not yet enroll this biller, you may tick “Pay a Company/Biller that is not yet enrolled.” Enter the amount you wish to transfer. The remarks field is optional. You have the option to enroll BDO Nomura as a company/biller for future payments or funding. I recommend you tick the option for this since you will use this anyway in the future. You’re done. You will receive a confirmation message like this for the successful funding. You will also receive a confirmation email from BDO as usual. You may check your BDO Nomura Cash Balance to see if your money has been credited. In most cases, it will be in the morning trading day. Cheers! You can also fund your BDO Nomura trading account manually via bank deposit. Follow the guide below. Fill out a Payment Form from BDO. Select the account you wish to use in funding your BDO Nomura account. Select BDO Nomura. Hi. There’s no option for BDO NOMURA in the Company/Biller choices. Did it change names already? I’m very new in trading but I would like to try it and Im very much interested. You have mentioned in your previous post about year end bonus when you have shares of certain companies, how would you know or rather where can I find it on the site. And one more thing, can you sell stocks even if the market is closed and can you always sell stocks without having it rejected? Hi Josel. The bonus thing I mentioned was about dividends. Every company especially the list we have for best blue chip stocks give away dividends regularly. You would know by checking out your broker’s dashboard or simply by going to our Dividends page here at Dailypik. When the market is closed, you can make an order to sell stocks by making GTC (Good-til-cancelled) order. So far I had never encountered any rejected order when I sell stocks. I only deal with the stocks I recommend in this website. Cheers and Happy Holidays! Then decided to add fund, my second deposit is P2,000 (June 13 Nomura site/fund) . And as i checked today(June14) only P1,000 is added to my account. Overall i would have 3k, but my account now only have 2k including bought shares (44cah bal+1,280+670shares+45tax. Am i missing something? Hi Allyce, double check your SOA (Statement of Account). If you see any discrepancies with your account, then contact BDO Nomura. Cheers! mam gud day if i transfer today does my balance appeares also today ? Hi archie.. I also did the same thing you do,right now.. I just want to ask you if it works to you to fund your BDO Nomura Acct. using Send Money..
Hi Ma’am Phel, thank you for your post, it helps me a lot. Meron akong tanung patungkol sa DBO Namura, approve na yong application ko at naka access na ako sa PSE. Pwede ba gamitin ang DBO Namura sa Mutual fund investment? Like Phil Equity? Thanks for ur response..
Hi Fehl , I was wondering if Nomura is a good Broker to buy stock for keep ? or is just like a trader that is good to make intraday transaction ..
I’m not really keen to make intraday transactions .. I tried once and I ended up losing everything .. And quite frankly didn’t know what I was doing … All i wanted was to buy a stock to keep ..
What about the fees ?? how much is the minimum amount of money do you think is best so the fees won’t eat up everything ? Hi, Fehl. I have the same problem. I funded my nomura account this morning and i dont see my buying power anywhere. The funding is already confirmed via email. Also, everytime i go to other pages like the FAQs or try to look at my profile, it logs out of nomura and i have to log in again. Weird. Am i doing something wrong? Like you, i’d like to use this account just for flipping and use my COL for long term stocks. Hi, Irene. The funding is taking too long with BDO Nomura. I think because it’s still new, they need to improve things more just like any broker new in the market. It will surely reflect the next day thought. You’ll see Cash Balance by going to your Portfolio tab. I did fund transfer 2 days ago using bdo -nomura ((dropdown option) got an email confirmation and online transaction history that the fund was transferred however it is not showing on my balance.. did send an email na din po to bdo and awaiting for their feedback. Was just wondering what happened. Did you see it already the next banking day? Paano kung gusto ko bumili bigla ng stocks tapos wala akong buying power. May pros and cons din pala. Same lang din pala ng BPI Trade, next day pa credited. Can i also deposit/fund my account via the BDONomura website deposit/funding tab?